A key to efficient development of large-scale water infrastructure projects is the seamless allocation of risk and balanced incentive structure of the Public-Private Partnership model. A long-term water purchase agreement with predictable pricing. Fully-insured, turnkey, fixed price and date-certain engineering, procurement and construction (“EPC”) contracts. Timely construction and overall project implementation. High service quality and assured adherence to all statutory requirements. Clear assignment of risks for changes in energy consumption and price levels. Explicit performance guarantees for project operations. Lowest overall financing cost consistent with attracting private equity capital. 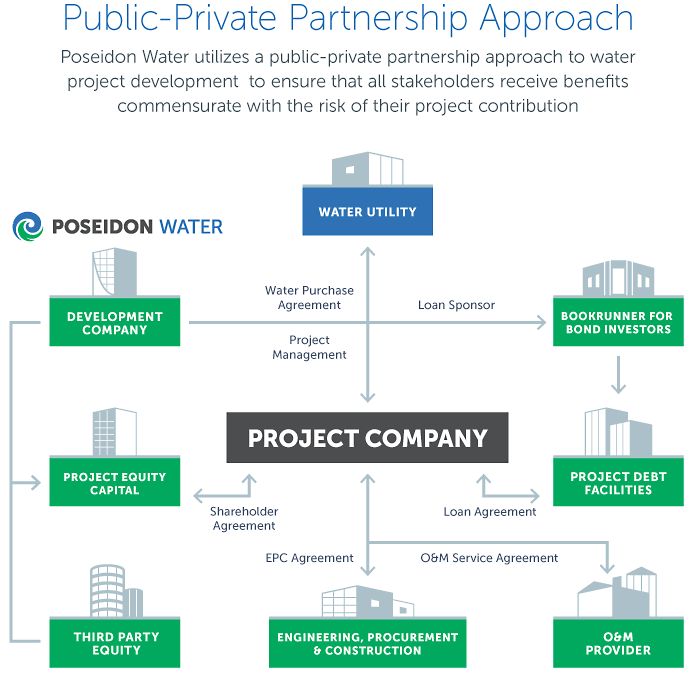 Poseidon assembles teams comprising water agencies, EPC contractors, plant operators and other key specialties. Careful early structuring and ongoing implementation of projects ensures that all parties have ​clearly-defined roles and responsibilities, and are rewarded in proportion to their project contribution. Reverse osmosis, semi-permeable membranes, pipelines ... just what is the science all about? Get an overview of desalination.